This dainty, feminine necklace and bracelet set makes a lovely gift for your young daughter, granddaughter, niece or goddaughter. Whether it's her birthday, a special occasion or you simply want to spoil her, the wooden necklace and bracelet set are a great choice. Very different from plastic and base metal designs that you find on the high street, this is a beautifully created wooden necklace and bracelet set for girls created by Finnish designers Aarikka. It is light to wear, durable, eco-friendly and designed specially for little ladies. 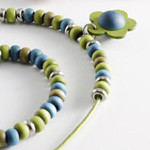 With mixed green and blue coloured wooden beads, the girly Karkkila jewellery set comprises one necklace with a dainty flower pendant and matching bracelet. The necklace cord is 38cm long. The bracelet measures approximately 5cm diameter, but its elastic cord will allow it to stretch slightly. Not a fan of mixed green? Arctic Fashion also have a purple jewellery set for little girls.